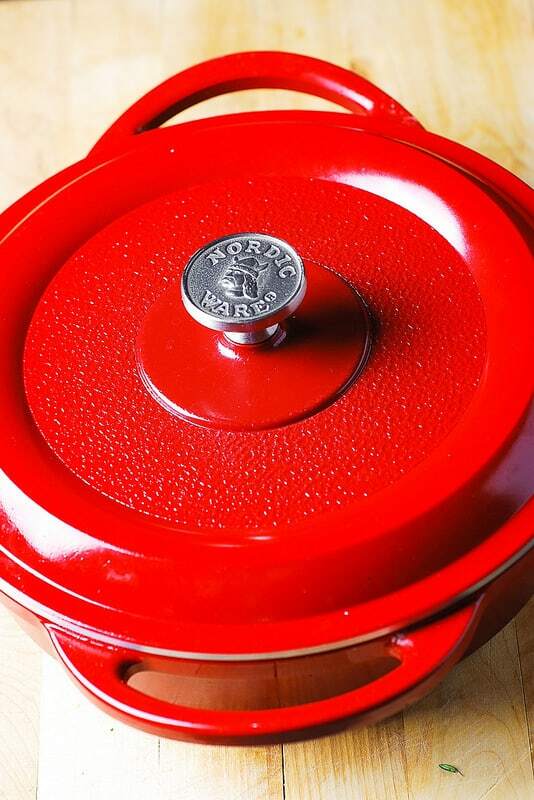 Disclosure: Nordic Ware sent me the free product (the beautiful 10 inch braiser pan you see on the photos) to try out – I’m loving my new pan and providing a brief review of this pan in this post. I was not compensated for this post other than receiving the 10 inch braiser pan for free! All opinions are my own. 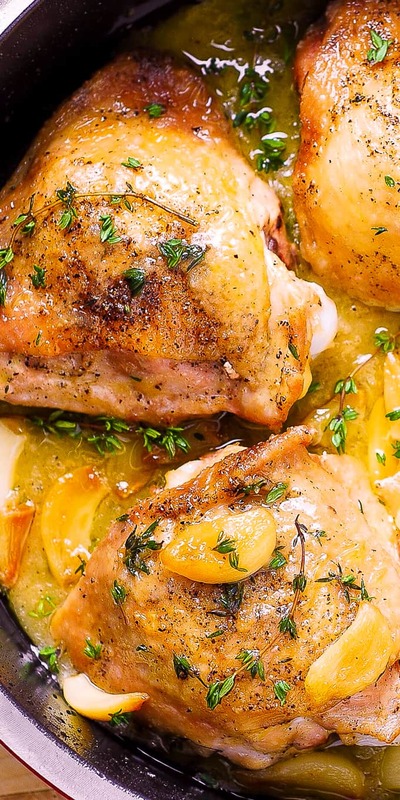 RECIPE: Garlic Thyme Chicken Thighs with a flavorful gravy – this chicken is baked in the oven, is super easy to make and takes only 35 minutes from start to finish, with just a few simple ingredients. I use 20 garlic cloves and fresh thyme. Your whole family will love this dish! These BAKED chicken thighs are so GOOD! I use bone-in skin-on chicken thighs. You’re basically roasting whole garlic cloves together with the chicken thighs, and the chicken gets infused with the garlic flavor! In the end, you have about 20 delicious cloves of roasted garlic – just enough to go with the each bite of chicken. And adding fresh thyme to the garlic chicken gravy just makes everything even better and even more flavorful! Comfort food made completely from scratch at its very best! To make this dish you’ll need to use an oven-proof pan, such as cast-iron pan or an oven-proof braiser pan. I’ve used 10 inch braiser pan from Nordic Ware – it cooks just like cast iron, but is much lighter in weight (it’s cast aluminum) and much easier to handle. It’s also non-stick and is very easy to clean! 10 inch braiser pan makes just enough food for 2-3 people – excellent choice if you’re cooking for a small family or a small company. In an oven-safe braiser pan or big, oven-safe skillet with a lid, heat the olive oil over medium high heat. Cook the chicken thighs skin side down on medium-high heat until well browned, for about 5 minutes, then flip the chicken thighs skin side up and cook for another 3 minutes. Remove the chicken thighs to a plate. Reduce the heat to medium, add 20 garlic cloves to the same pan, and cook garlic for about 3 minutes, occasionally turning, until garlic starts to soften and brown. 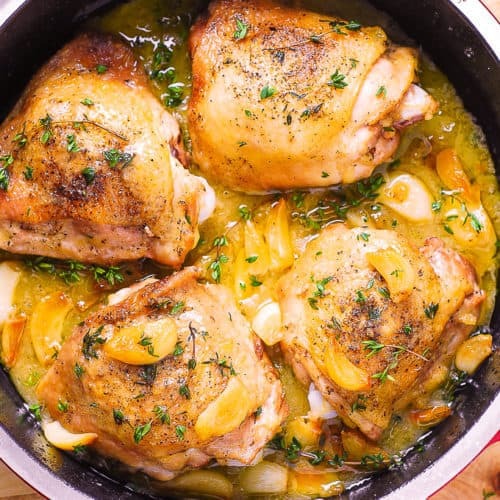 Return chicken thighs to the braiser pan, cover with the lid or aluminum foil, and bake for 15 minutes in the pre-heated oven at 400 F.
Remove the pan from the oven and put it on a stove top – the pan will be very hot, be sure not to touch it, including the lid. 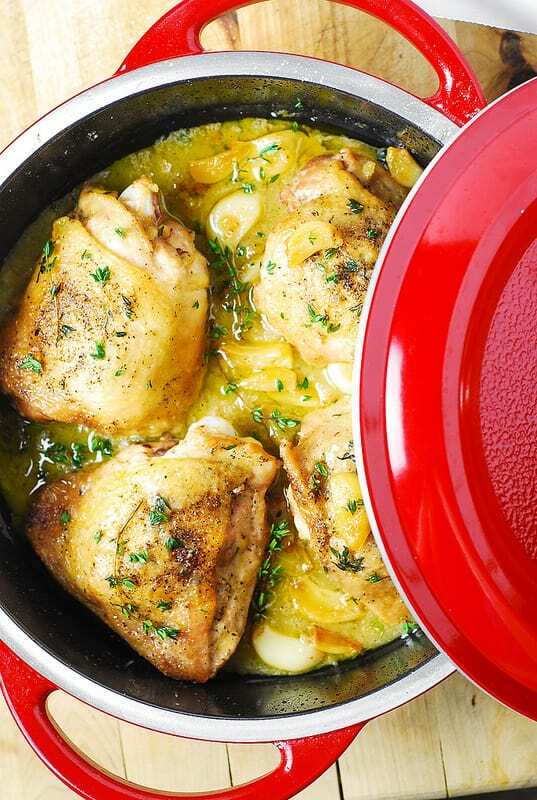 Remove the chicken thighs and garlic from the pan to a plate. Remove all but 2 tablespoons of oil from the pan. Over medium heat, whisk in the 2 tablespoons of flour in the 2 tablespoons of oil in the pan. Over medium-high heat, gradually whisk in the chicken broth and fresh thyme leaves for 1 or 2 minutes, until the sauce thickens. Remove the pan from the heat, and season the sauce with salt and pepper. Add the roasted garlic and chicken thighs back to the pan to reheat the chicken. 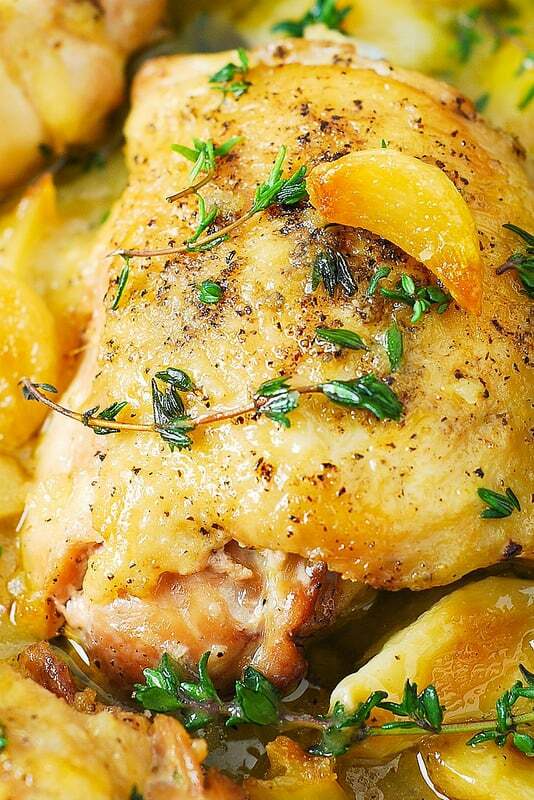 Garlic Thyme Chicken Thighs with a flavorful gravy - baked chicken recipe. Takes only 35 minutes from start to finish. Use bone-in, skin-on chicken thighs and 20 garlic cloves. 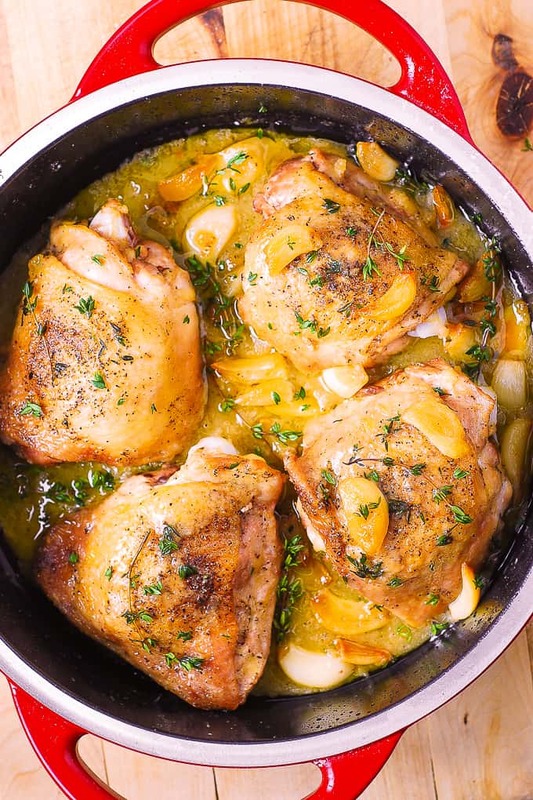 In an oven-safe braiser pan or big, oven-safe skillet with a lid, heat olive oil over medium high heat. Season the chicken thighs generously with salt and pepper. Cook the chicken thighs skin side down on medium-high heat until well browned, for about 5 minutes, then flip the chicken thighs skin side up and cook for another 3 minutes. Remove the chicken thighs to a plate. Reduce the heat to medium, add the garlic to the same skillet, and cook, occasionally turning, until garlic starts to brown, 3 or 4 minutes. Return the chicken to the braiser pan, cover with the lid or aluminum foil, and bake for 15 minutes in the pre-heated oven at 400 F.
Remove the pan from the oven and put it on a stove top - the pan will be very hot, be sure not to touch it, including the lid. 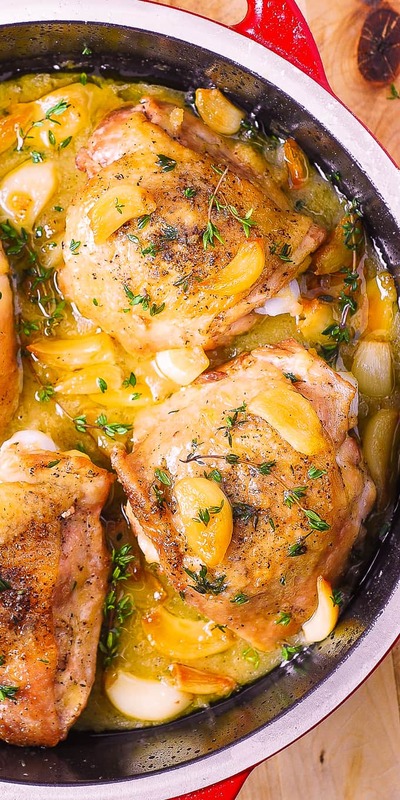 Remove the chicken thighs and garlic from the pan to a plate. Remove all but 2 tablespoons of oil from the pan. Over medium heat, whisk in the 2 tablespoons of flour in the 2 tablespoons of oil in the pan. Over medium-high heat, gradually whisk in the chicken broth and fresh thyme leaves for 1 or 2 minutes, until the sauce thickens. Remove the pan from the heat, and season the sauce with salt and pepper. Add the roasted garlic and chicken thighs back to the pan to reheat the chicken. This recipe was super good and easy. I followed just as written and turned out delicious. I made mashed potatoes to go along with for the gravy. Yum! Thanks for the recipe! 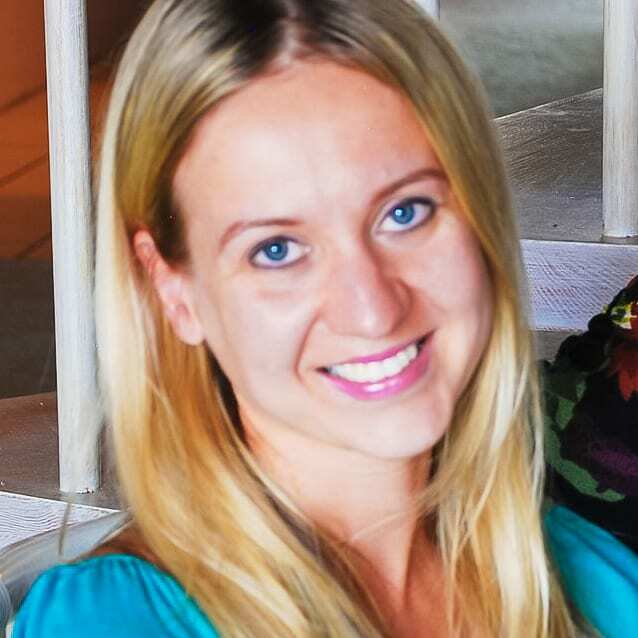 Could I use thin boneless breasts instead of thighs? If so, do you think I could skip the oven? Yes, you can use boneless chicken breasts instead of thighs. You might have to reduce the cooking times. Skip the oven and maybe cook a bit longer on the stove top, until the chicken breasts are cooked through. This was a big winner for my family! Making it for the second time tonight! It is fun using thyme from my garden! I made this last night and it was so good and easy! Hubby gave it a “two thumbs up” and asked that we add it to our rotation of recipes. He even got to take a leftover chicken thigh for lunch today which did not disappoint. Thank you! Was wondering about the last ingredient in the recipe….2 Tbsp butter. Is it used only if you need to thicken the sauce a bit more? There’s nothing listed in the recipe (that I see anyway) showing it’s use at all. Thanks. I haven’t used 2 tablespoons of butter in this recipe at all – I have updated the recipe, so now it should read correctly. Hi Julia, what an amazing way to enjoy chicken. Looks delicious!